This article is the first part of a 2-article series on the growing role of energy storage as illustrated by presentations at a recent EIA conference. See tomorrow’s part 2. At various points every month, every quarter and every year we look forward to the data releases of the US Department of Energy’s (DOE) Energy Information Administration (EIA), as they represent the formal, official and most detailed data on energy in the United States. At the 2018 EIA Energy Conference, the tightly delivered 15-minute presentations varied from oil, and gas, to electric and automated cars, with a touch of efficiency and energy storage – and of course a whole lot of data. EIA staff members dutifully worked their stations interacting with conference attendees and shared great conversations at the networking lunches. Specifically, the topic of energy storage was all about growth and how the industry is no longer just talking about energy storage, but deploying projects in the real world with real benefits, consequences and savings. Lisa Cabral, of the U.S. Energy Information Administration, delivered Energy Storage: a U.S. overview (PDF). At a high level, Lisa’s presentation showed that the CAISO and PJM ISO reigons dominated the 664 MW of power and 742 MWh of of large-scale (over 1 MW) energy storage that is now operational. This was driven by state policy and market rules, and the large majority of this volume is lithium-ion batteries. Many of the slides create a clear picture of the evolution of the industry since the early 2000s – expanding regions, product type (spoiler above), pricing, as well some future market size projections. The diversity of applications speaks of the many ways we’re going to come to depend on this solid-state electricity and energy source. One slide that we most recently saw a large shift around was the residential/small scale volume relative to the big players. Just last week, GTM Research showed us that residential storage grew almost 9x over Q1 2017, representing almost 28% of all energy storage MWh deployed. We’ve been expecting this of course, as the customer has spoken. Eric Gebhardt, of GE Power delivered Electricity Industry in Transition (PDF) – and seeing Gebhardt speak prior to other battery groups was fitting, as GE is a company on all sides of the energy industry. They’ve recently cut back their gas power division as a result of renewables growing so much, and they’ve launched the world’s largest offshore wind turbine. – making the company a fitting spokesperson for the energy transition. Different professionals, based upon where they work, will focus on different parts of the above chart, and this gives a bit of structure to the image presented by Cabral. The larger point is that a broad marketplace for energy storage exists, with each segment varying in size and usage case. The presentation referenced the Philadelphia Navy Yard Microgrid – which integrates fuel cells, multiple rooftop solar installations totaling 1 MW, a natural gas peaker plant, as well smart meters and other energy management enhancements. These are all areas of expertise that GE has within its broad umbrella. Two data points from this slide that represent the future design are a 50% reduced construction time in the field due to further modularization, and up to 50% more solar due to enhanced loading ratios. We’ve seen evidence of both of these trends, with 100 days to deploy a record volumes of energy storage and increasing DC:AC ratios at some solar+storage installations. Gebhardt also delivered a great description of energy storage applications across solar, wind and thermal facilities. Sherif Abdelrazek, of Duke Energy presented Grid Tied Battery Energy Storage: A Regulated Utility’s Path Forward (PDF). His talk started with Duke’s history of R&D with 40 MW of various lithium battery chemistries. Abdelrazek stressed that Duke Energy, being a regulated utility, had a legal obligation to deliver a business plan, and then prove that business plan in a scalable demonstration before moving onto capturing the benefit as a standard utility. Along these lines, the company showed off an early test case of solar+storage as a replacement for 58 power lines on the side of a mountain. Currently, Duke is moving into the phase of proving the business case and figuring out how to capture the benefit it theorizes is following. Duke’s energy storage pipeline spreads across the Southeast. 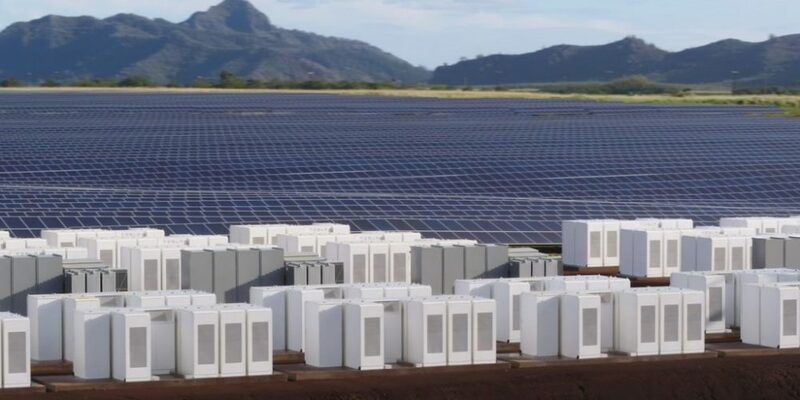 The company noted that energy storage is viable for ancillary services in stand alone facilities or AC-coupled with solar power, as well as to support renewable energy integration when DC-coupled. It is Duke’s opinion that DC coupled solar plus storage is a finally mature and technically technology. Energy storage couple on the DC side is noted as providing a ‘semi-dispatchable’ trait. As falling module prices are already driving high DC-AC ratios, the falling prices of energy storage are similarly causing a feedback loop in system design/sizing.